Judy Chamberlain is a singer who’s always a pleasure to hear. In part, because her astonishing repertoire makes every performance a fascinating journey through a century of song. But even more so because she brings such care, authenticity and musicality to everything she touches. Her appearance at Spazio in Sherman Oaks Saturday night was further enhanced by the presence of a sterling back up ensemble — pianist Bill Cunliffe, bassist Tony Dumas and drummer Devin Kelly. Despite the fact that Chamberlain was, as always, utterly spontaneous about her choice of songs, the trio — guided by Cunliffe’s deep understanding of the subtleties of vocal accompaniment — found the right framework for every tune. 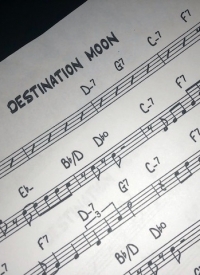 Which was a considerable accomplishment, since the program ranged in all directions: classics such as “Summertime,” “Lover” and “September Song” (done with its scene-setting verse); the very different jazz-oriented grooves of “Why Don’t You Do Right?” and “Night in Tunisia”; off-beat items such as Don McLean’s “And I Love You So” and Quincy Jones’ “Who Needs Forever?” Chamberlain’s interpretations combined an empathic respect for lyrics and story telling reminiscent of Mabel Mercer and Peggy Lee with her own conversational approach to phrasing and occasional twists of melodic paraphrase. She also made it clear, from the first number, that the evening’s framework — with Cunliffe present as a guest artist — would be a jazz setting. Solo spots were open for the instrumentalists in virtually every tune. And the impromptu arrangements often took such unusual stances as beginning with a bass solo, or ending with the drums. Sitting through two sets overflowing with irresistible songs, I recalled a remark Cunliffe had made before the music began. “I live in Studio City,” he said, “and within 10 or 15 minutes, I can be at any one of five different jazz rooms — the Baked Potato, La Ve Lee, Charlie O’s, Vibrato, and here at Spazio.” He was right. Add a half hour or so to his suggested time frame and Catalina’s and the Jazz Bakery could have been included. And it’s rooms such as these — with the vital presence of performers such as Chamberlain and Cunliffe — that are the in-the-trenches areas where jazz lives and thrives, even in today’s uncertain economy.